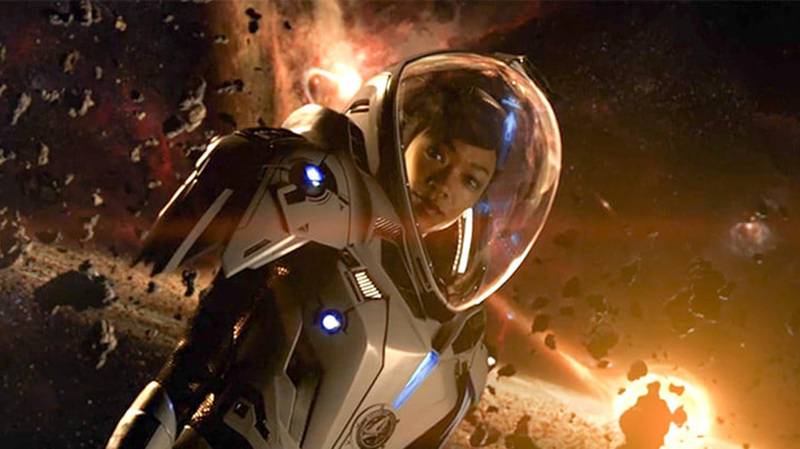 As the first Star Trek television show in more than a decade and the first major new series entry following the venerable sci-fi franchise's 50th anniversary, Star Trek Discovery is under an incredible amount of pressure. For the creative team behind the production, which has weathered the departure of a showrunner and production delays, it needs to both boldly go where no Star Trek series has gone before and simultaneously feel like the familiar spacefaring adventure that has enthralled viewers for half a century. For CBS, it needs to beam up scores of subscribers to its CBS All Access service, the subscription streaming service where all 15 episodes in the series will exclusively air following the network debut of the two-part season premiere. Most all of, for the fans, Star Trek Discovery needs to adhere to a deceptively simple Prime Directive: "Please be good." After seeing the first two episodes at the show's Los Angeles premiere, I am pleased to report that it largely succeeds in its mission, offering an ambitious and auspicious start to what feels like a welcome return to form for Star Trek. Set ten years before the events of The Original Series (or 90 years after Star Trek: Enterprise, the 2005 series that preceded it), Star Trek: Discovery is set against the backdrop of a brewing conflict between the warlike Klingon Empire and the pragmatic United Federation of Planets. This time around, though, a starship captain is not our main character; rather, we experience much of the events of Discovery through the eyes of First Officer Michael Burnham (The Walking Dead's Sonequa Martin-Green), a headstrong, highly skilled human Starfleet officer who was raised by Mr. Spock's father, Sarek (James Frain), after her parents perished in a Klingon terrorist attack. Raised in a culture not her own, Michael is the first human to graduate from the Vulcan Learning Center and Vulcan Science Academy. As a result, she is a bit of an odd duck, finding herself in a constant inner battle to maintain balance between her logical and emotional impulses. 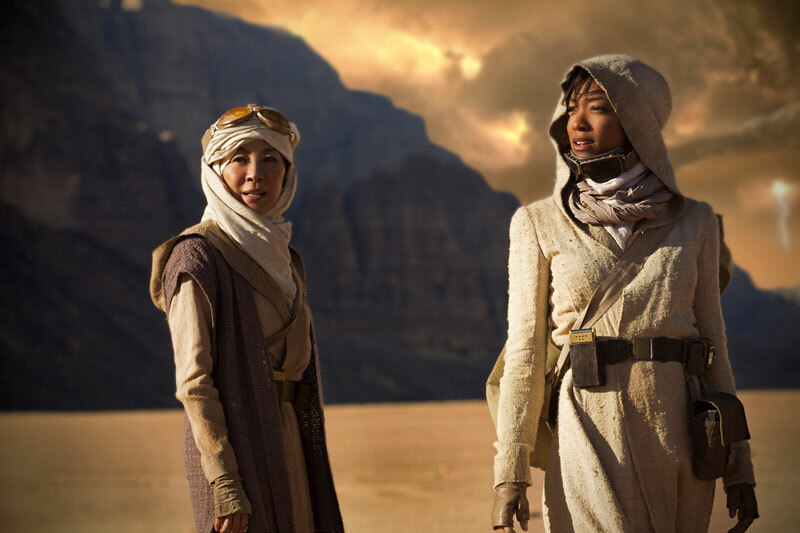 We first meet Michael as she trudges around a dusty desert planet on an away mission alongside Captain Philippa Georgiou (Michelle Yeoh), the captain of the USS Shenzhou, the starship on which she has served for seven years. We get to see a nice bit of bonding between these two and a real sense of the mentor-mentee relationship that exists between them as Philippa tells Michael that she is ready to command her own ship. It is also the last time things will ever be so simple for the duo, as well as for the crew of the Shenzhou. What follows is a series of increasingly tense and, in some cases, unfortunate events that puts Michael at odds with the rest of her crew, and finds the Federation encountering the Klingon Empire for the first time in nearly a century. This isn't a random occurrence though; the Klingons are rallying behind a charismatic firebrand named T'Kuvma (Chris Obi), a populist leader who whips his followers into a frenzy, using religious imagery and stoking fears based on racial supremacy. It feels uncomfortably timely given the sociopolitical climate in America right now, and will provide the perfect antithesis for Gene Roddenberry and Discovery's dream of a utopian future in which all races and species come together as one for the betterment of all. While Sonequa Martin-Green carries does much of the heavy lifting, she is not alone. The supporting cast is incredibly charming and immediately places the viewer in the comfortably familiar milieu of Star Trek. Michelle Yeoh's Captain Philippa Georgiou is ferociously likable, a born leader with a powerful moral compass who makes you wish for a mentor figure like her in your own life. The show's biggest standout, apart from Martin-Green, is Doug Jones' Saru, the ship's science officer, who will be its resident "Spock" figure. Saru is a member of the Kelpien species, a race that has evolved to be able to "sense death," an ability that unfortunately will come in all too handy. A risk-averse worrywart with an exceptionally dry sense of humor, Saru serves as a perfect foil for Michael, who as we learn is a woman of action. Michael and Saru constantly being at loggerheads with one another will likely be a fixture of the series going forward and plays out to particularly dramatic effect in the series premiere. Not everything in Star Trek: Discovery is quite so effective, though. Harrison Ford once famously said, "George, you can type this s**t, but you can't say it" to George Lucas about his Star Wars script, which was rife with space fantasy jargon and fantastical terms that don't quite roll off the tongue. This quote feels particularly salient in regards to Star Trek: Discovery, which sometimes suffers from having its characters speak in terms that oscillate between too pretentiously poetic and too obtusely steeped in lore. It isn't a persistent problem, and most of the cast acquits themselves admirably, but there were moments where you could feel the actors struggling to get through some of the lines they'd been tasked with delivering. As a prequel series, Star Trek: Discovery has its work cut out for it. We know where the series must eventually arrive, but how will they get there? Based on the premiere, it seems that the path to peace is going to be long, bloody, and full of unexpected twists and turns. The first two episodes of Star Trek: Discovery are largely successful and wholly compelling, laying the groundwork for the war ahead, introducing us to the fanatical Klingon threat and presenting us with characters that face genuine moral quandaries. It doesn't pack quite the same punch as something like Battlestar Galactica's momentous 2004 premiere episode "33", which remains my high-water mark for any sci-fi series premiere, but it manages to walk a delicate tightrope. With Discovery, they have created a new series that both pays homage to the half-century of Star Trek history that preceded it and one that feels thoroughly modern in its storytelling. Whether the show will continue its initial momentum of its explosive series premiere--and if audiences will even tune in to see it behind a paywall--remains to be seen. As it stands now though, Star Trek: Discovery lured me in with compelling performances, clever yet familiar world-building, and enough surprises that I'm eager to find out where it will boldly go from here. Star Trek Discovery airs Sundays on CBS All Access. The Nerdist Podcast's own Matt Mira is hosting the Star Trek: Discovery after show! These are the most rewatched Star Trek episodes on Netflix! Here's our dream cast for a Deep Space Nine movie!